Pen & Sword Books LTD is located in the U.K. This book is paperback of 8 1/2" by 11" page format in 208 pages. 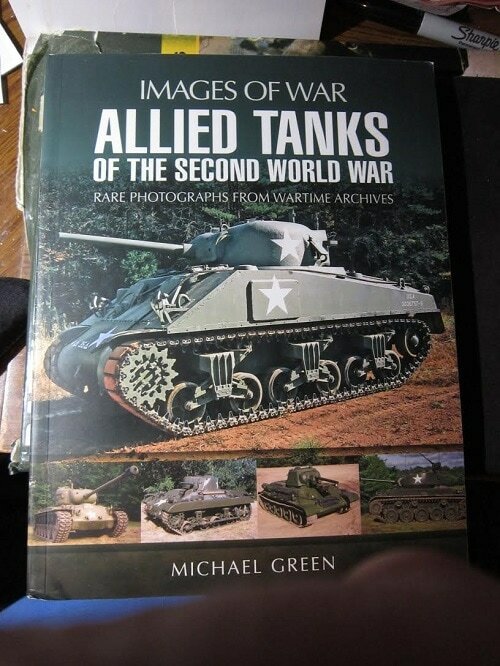 The expert author Michael Green has compiled a full inventory of the tanks developed and deployed by the Allied armies during the six year war against Nazi Germany and her Axis partners. There were four catagories of tanks: light, medium, heavy and super-heavy. Combat experience proved light tanks (such as the Stuart and T-26) to be ineffective. Medium tanks (the U.S. M4 series, named Sherman by the British, and the Russian T-34) soon dominated with their fire power, production and mobility. The later stages of the war required the Allies to answer the Axis Panther and Tiger tanks with up-gunned and up-armored second generation M4's, T-34/85's and the Sherman Firefly. Totally new heavy tanks such as the M-26 Pershing, Soviet KV-1 series and the British Centurion only saw action in the final months of the war. Allied Tanks of the Second World War covers all these catagories in detail as well as the few super heavy tanks such as the French Char 2C and the TOG. For an informed and highly illustrated work the book has no comparable rival. Michael Green is the author of numerous acclaimed books in the Images of War series including Armour in Vietnam, U.S. Navy Aircraft Carriers, U.S. Battleships, The Patton Tank, U.S. Naval Aviation, American Infantry Weapons, M1 Abrams Tank and Combat Aircraft of the USAF. He lives in California. This new book contains 149 color photos (counting the ones on the cover too). There are 118 black and white photos. At the back of the book there is 6 blank pages labeled at the top "NOTES". The French FT-17, AMR33, AMC35 ACG1, H-39 (2 photos), R35 (2 photos), SA38 and FCM 36. The Soviet T-37A (2 photos), T-38, T-40, T-30, T-60 (2 photos), T-70M, Vickers Mk. E, T-26 model 1931 (2 photos), T-26 model 1933 (2 photos), T-26RT model 1933 (2 photos), T-26 model 1938 (2 photos), T-50, BT-2 (2 photos), BT-5 (2 photos), BT-7. British "Whippet" Medium A, Mk.II, Cruiser Mk.1 A-9 (2 photos), Cruiser Mk. III A-13 (2 photos), Cruiser Mk. IV A-13, Cruiser Mk. V A-13 Mk. III, Mk. I A-11 "Matilda" (2 photos), Mk. III "Valentine" (3 photos). Soviet T-28 (3 photos), T-34 model 1940, T-34 model 1942 (2 photos), 3 photos of the interior of the T-34 model 1942, T-34 model 1943 (3 photos), photo of the T-34 model 1943 interior. U.S. M3 (6 photos), photo of the M3 interior, M3A2, M4 (5 photos), M4A1 (6 photos), 2 photos of the M4A1 interior, M4A2 (4 photos), 2 photos of the ammo used in the M4A2, M4A3 (3 photos), M4A4 (2 photos), M4A6. M4A5. British Cruiser Mk VI A15 (2 photos), Mk. VIII A27M "Cromwell" (2 photos), Cruiser A30 "Challenger", A34 "Comet", A41 "Centurion, Mk. IV A22, "Churchill" Mk. III, "Churchill" Mk. IV, "Churchill" Mk. VII, A43 "Black Panther". This is a very detailed and illustrated book that will be of great interest to modelers and military historians alike. I want to thank the folks at Pen & Sword and Casemate who sent me this sample.